So I already veered from my menu plan this week. After I cooked my whole chicken in the slow cooker on Tuesday, I decided I didn’t want to use the leftover chicken as I had planned in my chicken and tofu enchiladas. 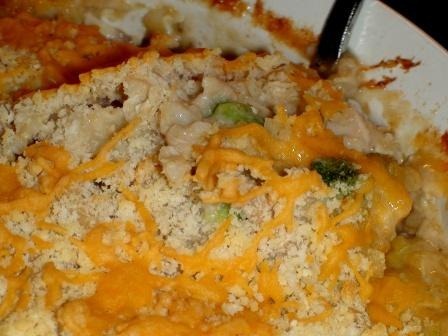 What I really wanted was a comforting casserole, and for some reason, the first thing I thought of was a chicken, rice and broccoli casserole. Now, I am really not much of a casserole person, despite my Southern roots, and I rarely eat them, much less make them (outside of lasagna that is). I really don’t know where this hankering came from, but what I created was darn delicious and really hit the spot. But the best part was that this was a super fast meal to throw together as most of the ingredients were already prepared and on hand (and no cream of whatever soup required – or allowed!). All it needed was a salad and fruit on the side. It took maybe 30 minutes altogether, and most of that time it was in the oven. 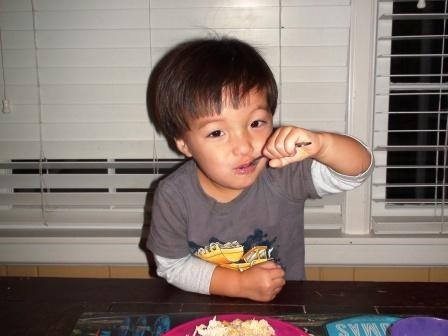 Everyone gobbled it up, including my son. He was even picking out the broccoli, to eat! 1. Spray a 2 1/2 quart casserole dish with cooking spray. Preheat oven to 400 degrees F.
2. Melt butter in a large sauce pan over medium heat. Stir in flour and continue to stir for one minute. Gradually add milk and chicken broth, stirring to mix well. Bring to a simmer and continue to gently stir until thickened. Add thyme, 3/4 cup cheese, salt and pepper. Stir in well until cheese melts. Remove from heat and stir in chicken. 3. Spread rice and broccoli in bottom of casserole dish. Pour chicken mixture over rice and broccoli and stir to combine. Top with bread crumbs, parmesan cheese and remaining cheddar cheese. 4. Bake in the oven for 20 minutes or until slightly browned on top and heated through. Enjoy! 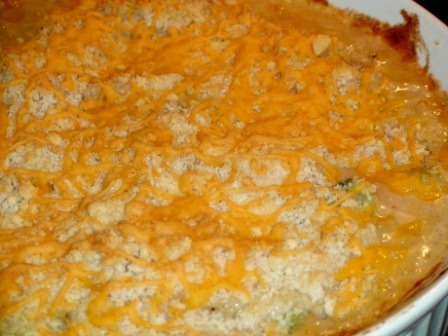 What are your favorite comforting casseroles?